According to Jessi, one of the rising trends at the moment is passing traps on the course. These traps are obstacles which are placed in a way that they would be logical for the dog to perform but instead need to be passed. The same trend was also visible in WAO. As a judge, Jessi thinks that in big and important competitions the courses shouldn’t be too difficult. The big event itself builds pressure for the competitors which already makes it harder to nail runs in comparison to small town competitions. “In WAO 2018, this was also taken into consideration well” she states. 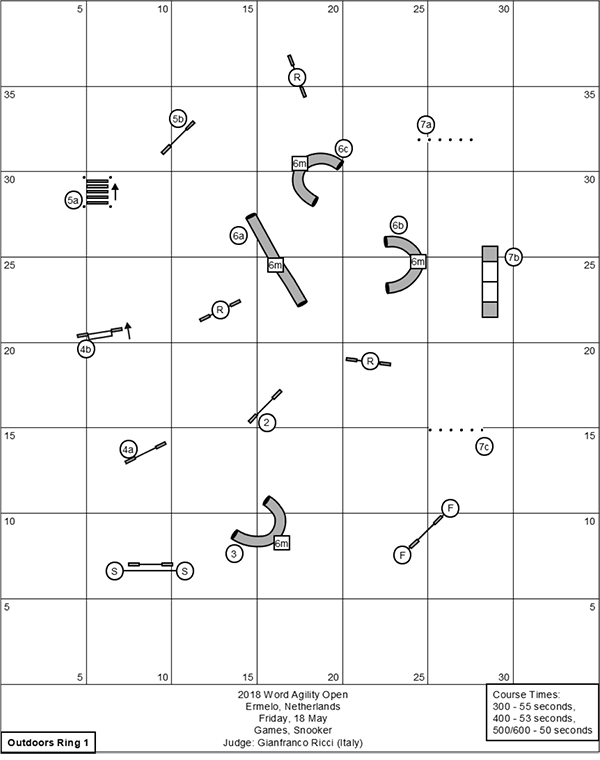 “At the end of the biathlon agility course by Gianfranco Ricci, there was a challenging tunnel – dog walk differentiation. For us Finns that part was a bit vexing since it cost Juha Orenius the medal,” Jessi ponders. But for the audience, this part offered a lot of excitement and evoked an atmosphere of a big sporting event. The most interesting section of all the WAO courses, according to Jessi, was Barrie James’ tunnel section on the biathlon jumping course. Two tunnels were next to each other and they were performed three times. There was a good chance of disqualification in those sections. According to Jessi, better training is needed for the dogs because the speed in agility is increasing. “Before we had either technical but quite slow courses, or more linear, fast courses. Now we’ll see more and more technical but, at the same time, fast courses. In AWC 2018 we’re going to see that the dogs’ skills and the speed will resolve who wins.” Jessi says. When speed and dogs’ skills increase, agility will be more and more impressive for the spectators. “Now that the sport is developing fast and getting more challenging, in addition to training your dog better and developing your physique, you really need good coaching,” Jessi concludes. “We had great team spirit in Team Finland. Everyone on the team had deserved their place through qualifications. Teammates respected each other highly and the more experienced competitors helped those not as experienced. The newcomers, such as our team’s youngest, Josefina Sipilä, and Mauri, managed to really exceed all expectations,” Jessi comments. For Jessi, the most memorable runs in WAO 2018 were Janita Leinonen’s and Fu’s Gamblers final, which gained them third place. Also Berit Kittel’s and Nupsi’s Gamblers final made an impression on her. “And, of course, Team Sweden. Well, they have one Finn there, so that’s why they are always so impossibly good”, Jessi jokes, and points out that the next qualifications for Team Finland are 3.2.2019 with Jessi and Lee Gibson as judges. How to keep up with the sport? Keep track of your training and development in agility with the help of AgiNotes tools! Newer PostThe beta stage has ended: Welcome new features! Older PostWhy we built AgiNotes?